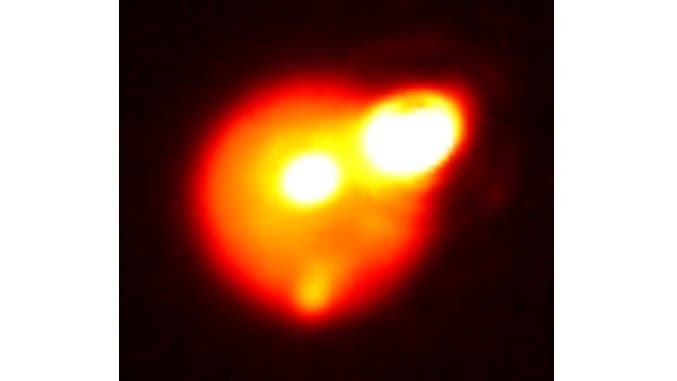 Io is the only known place in the Solar System with volcanoes erupting extremely hot lava like that seen on Earth. Because of Io’s low gravity, large volcanic eruptions produce an umbrella of debris that rises high into space. Such outbursts can send material hundreds of miles above the surface. The recent eruptions resemble past events that spewed tens of cubic miles of lava over hundreds of square miles in a short period of time. All three events, including the largest, most powerful eruption of the trio on 29 August, 2013, were likely characterized by “curtains of fire,” as lava blasted out of fissures perhaps several miles long. The 29 August, 2013, outburst on Io shown below was among the largest ever observed on the most volcanically active body in the solar system. 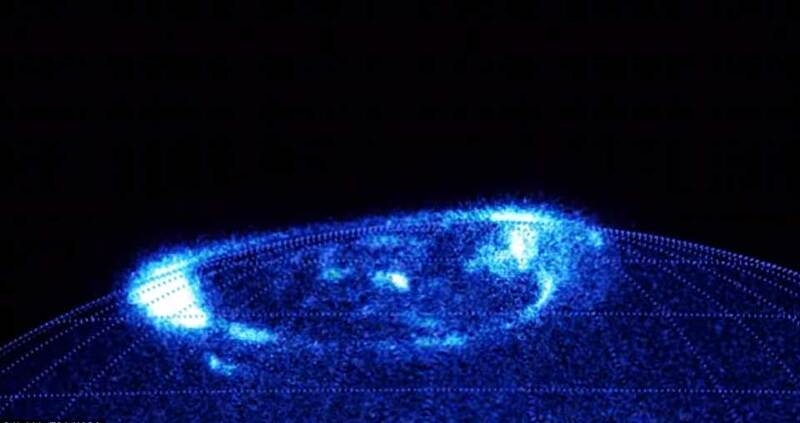 Infrared image taken by Gemini North telescope. Image credit: Katherine de Kleer, UC Berkeley. The brightest eruption at a caldera named Rarog Patera, was calculated to have produced a 50 square-mile, 30ft thick lava flow, while another close to a caldera called Heno Patera, produced flows covering 120 square miles. Both were located in Io’s southern hemisphere, near its limb, and were nearly gone when imaged five days later. Io produces about 100 times more lava each year than all the volcanoes on Earth. 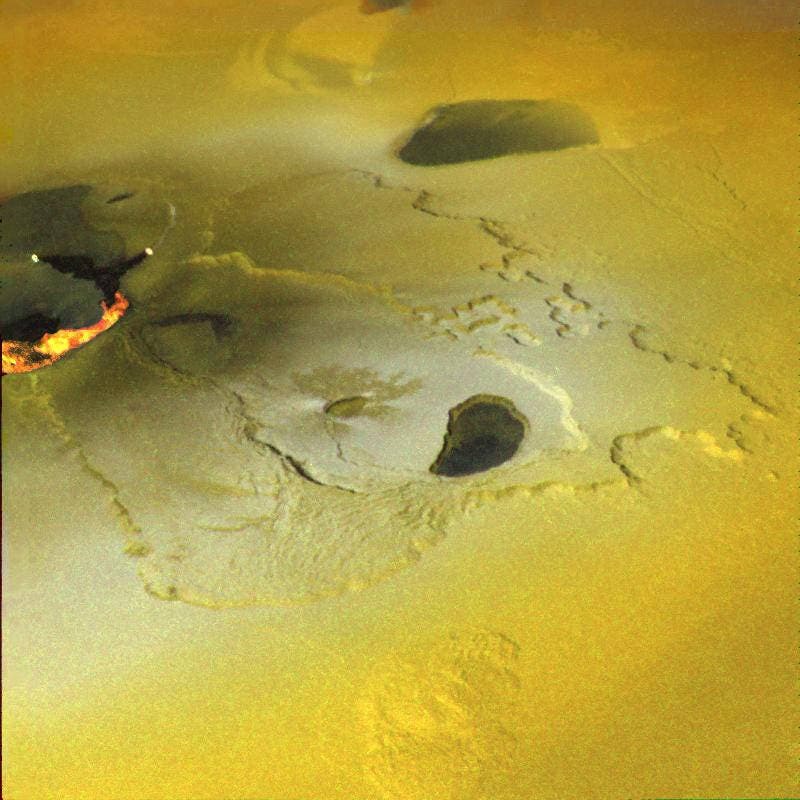 While Earth’s volcanoes occur in localized hotspots like the “Ring of Fire” around the Pacific Ocean, Io’s volcanoes are distributed all over its surface. A global magma ocean about 30 to 50 kilometers (20 to 30 miles) beneath Io’s crust helps explain the moon’s activity. NASA’s Voyager spacecraft discovered Io’s volcanoes in 1979, making that moon the only body in the solar system other than Earth known to have active magma volcanoes. The energy for the volcanic activity comes from the squeezing and stretching of the moon by Jupiter’s gravity as Io orbits the largest planet in the solar system.